Practices will be help Monday evenings and Saturday mornings at Grover Ice Rink. Your practice time will be determined by the coaches during the first practice and more specific information will be sent out a few weeks prior to season start with regards to when your player should come for the first practice. Rental equipment for check out ($20 fee per year and $50 deposit check) and Omaha Hockey jerseys ($25) and hockey socks ($10) for purchase will be available at the first practice. The Omaha Hockey Club Initiation Program (IP) offers beginning level hockey instruction to Omaha area boys and girls ages 4 and up. Players do not need prior hockey experience to join!! The 4-6 week sessions are designed to focus on skating instruction to get your player prepared to enter the IP program. Once completed or the required skating skills have been met, a seamless transition can be made directly into the IP program at the appropriate skill level. The ultimate goal of the initiation program is to instill an enjoyment of the game and a desire to continue to play the game at more advanced levels. IP gives players the chance to learn and improve critical hockey skills such as Skating, Puck Handling, Passing and Shooting all while having fun. • IP players will have one 60 minute session per week—no early mornings! 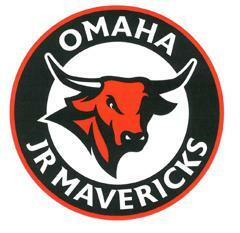 • All new players may purchase an Omaha Hockey jersey and socks for $35 (separate from registration fee). The new player will have their name put on the back of their jersey. (Returning players continue to wear the same jersey and socks). • IP players will have two 45-60 minute sessions per week. • All new players may purchase an Omaha Hockey jersey and socks for $35. The new player will have their name put on the back of their jersey. (Returning players continue to wear the same jersey and socks). 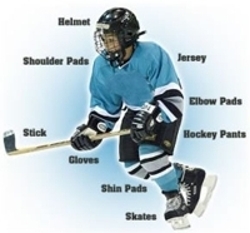 Click here for a list of what you need to wear to play ice hockey! Click here to find out how to clean hockey equipment. Includes helmet, gloves, elbow pads, shoulder pads, breezers and shin guards - everything you need to get started except skates, stick, compression jock and cup, jersey and socks. The IP Program gives players the chance to learn and improve critical hockey skills such as Skating, Puck Handling, Passing and Shooting all while having fun. ADM was created with the a core design that valued practices and proper training above all else. The design of ADM stresses that practices can and should be fun, especially if the kids are all playing together and having a blast with a game that they love. The more they play it, the better chance that they’ll love it. And when you combine a passion for the game with increased puck time, kids will start to excel at it. Play, love, excel. That’s the ADM. While in the development stages of ADM, it became apparent that critical areas in our system were neglecting kids at a very early age. All children progress through the same development stages and certain aspects of these stages must be addressed at the appropriate points along the development curve in order for our children to reach their potential. ADM provides maximum player development through age-appropriate structure and content. Without developing skills and certain physical and mental attributes at the appropriate time, the long-term prospects of becoming a truly elite player diminish each day.